The shirt I made is actually great. It's made of cotton, and looks wonderful. It has two problems, both with the collar. The first is that I didn't quite centre the rear buttonhole in the collar band, so that unless I made a custom separate collar with an off-centre buttonhole to match I can't wear collars. The other problem is that I didn't trim the excess fabric in the seams at the front enough, so that the collar stud can't make it through all four layers of the shirt that it needs to: two halves of the collar band, and two halves of the collar. The only way I can get the collar to stay fastened in front is to skip the back layer of the collar band, and only attach the collar to the front layer. 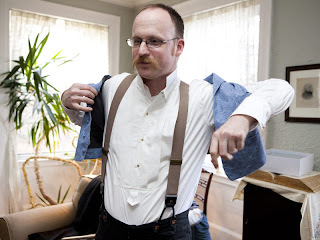 This works as long as I'm wearing a tie of some sort, but shows that the collar isn't really fastened if I don't. I'll work hard to make sure this isn't an issue with the new shirt (also, my wife gave me some new collar studs for our anniversary, and I think they're a little longer than the ones I had). The new shirt is to be made of the same linen I used for the Regency shirt. It's heavier than the cotton (the linen is 5.3 oz from fabrics-store.com), but I hope after some washings it will be very comfortable. In any case, it'll work as a winter-weight shirt if it doesn't soften up a lot. Once again, I'm using the Laughing Moon Mercentile #107 pattern. I don't need to make a muslin, because I know the shirt already fits. The first steps brought me through attaching the bosom bib and the trouser tab (which I've never actually used - I guess my trousers aren't high-waisted enough) to the shirt front. In the first shirt I made I put in a pleated bosom, but I left it plain on this one. You can see that my hand stitching isn't perfectly straight, but I'm working on it! I think maybe putting in a row of basting stitches to act as a guide might help. Any thoughts on how to keep my stitches straight? 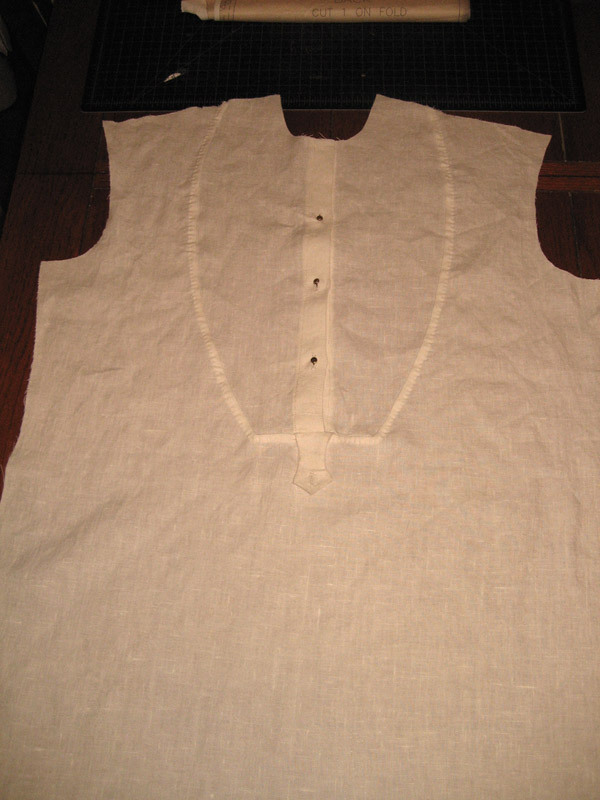 The bosom is attached to the front with a flat felled hem, though it's never called that in the directions. The part that actually took the longest was sewing the seven buttonholes (one for the trouser tab, and six for the button studs on the front). I'm happy with how they came out - I'm definitely getting better and hand-sewn buttonholes. Here I'm in the middle of serging the edges of the hole. You can see that it needs this step to keep the fabric from fraying - the loose thread running the length of the slit is from the fabric itself, not from my sewing. It's about to be held in place with the next set of stitches. And here's the finished product. The above shot is from the back, where I made my black chalk marks. This is the front, all neat and tidy.